For, if knowledge became too great for communication, it would degenerate into scholasticism, and the weak acceptance of authority; mankind would slip into a new age of faith, worshiping at a respectful distance its new priests; and civilization, which had hoped to raise itself upon education disseminated far and wide, would be left precariously based upon a technical erudition that had become the monopoly of an esoteric class monastically isolated from the world by the high birth rate of terminology. The quotation is from the preface to the 1933-edition of The Story of Philosophy (1926) by Will Durant. 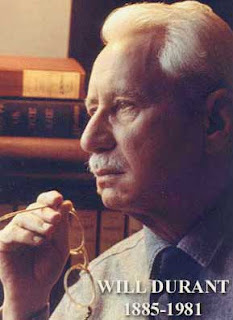 The picture is from the website of Will Durant Foundation, which is a good place for finding out more about the American philosopher. Durant was quoted by Iqbal (not the excerpt given here) in the article 'Islam and Ahmedism' published in January 1936 in reply to a series by Pundit Jawaharlal Nehru. Wow! As often, you encourage me to revisit and in this case visit really for the first time our American philospher, Durant. If more of his writing is anything like this is, we need to heed his concerns and pronto today because "the high birth rate of terminology" is over-taking and deadening our REAL live American children more than most other supposed enemies except perhaps addictions of all kinds. Yes, his book The Story of Philosophy initiated a kind of movement for making knowledge accessible to the common person. I have also not revisited him since my school days, so I do not know how many of his ideas I will find exciting today. Let's check that out. But in any case, we can certainly take from him the spirit and technique. It is also interesting that although he was much junior than Iqbal, and The Story of Philosophy was regarded as more of a best-seller and less of an academician's resource, Iqbal chose to quote from him rather than anyone else while making a point about Spinoza (a different excerpt) although many more "well-reputed" sources were available. I think, Durant represents yet another bridge that can connect the elite to the masses in their own societies, and the masses of one society to another. Again, I'm so glad and enriched to hear further elaboration as to Durant's connection to similar concerns, spirit and trend with Iqbal - parallel concerns while dating/references/links unknown. (left to historian/writers/artists such as you, Shafique Sahib, to help make for the rest of us and for our time. Along the same lines, I've discovered by "accident" also another American theologian's later works which seek to correct his earlier works - thus bringing his more matured considerations along the same lines as Durant's while not referring to such an historian by name. I will try to post (within week or so) with personal notations on this theologian. He was also concerned with the masses and the wider spiritual concerns of us all - where sometimes both our protestant and Catholic interpretations of biblical teachings have done great harm. I hope also in that future post to refer to your Iqbal discussions somewhat - on the relationship of individual growth of self/Self to the wider growth of various religious, regional and national communities of various kinds. (probably minus the names of specific political leaders as such since I'm more interested in "other leaders" with a longer range over the masses.